Popcorn Comedy comes to Brum! That’s right, Popcorn Comedy, a comedy night dedicated to bringing you the funniest online videos and stand up, is coming to Birmingham Comedy Festival! 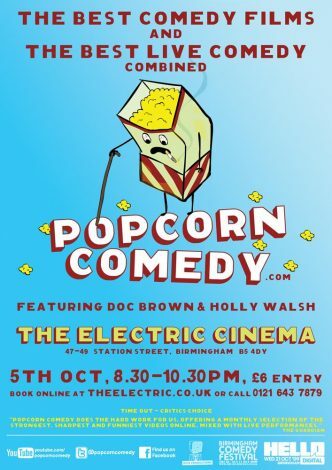 We’ll be presenting the opening night of Popcorn Comedy Birmingham at Britain’s oldest working cinema The Electric on Monday 5th October at 8.30pm, featuring the rap/stand up stylings of Doc Brown and the wonderful Holly Walsh live on stage, as well as a selection of the newest and funniest videos from the web in glorious high resolution. We should also be premiering a brand new video on the night too, so keep your eyes peeled for that. Popcorn is sponsored by the good people at Hello Digital. It’s near New Street Station and pretty much next door to the Old Rep Theatre if you don’t know it.